When working people stick together in a union, we have the power in numbers to raise wages and improve benefits like healthcare for our families and ourselves. We must rise up together and remind everyone that union members don’t just fight for the good jobs our communities need—our power in numbers gives us the strength to fight for quality, affordable healthcare, racial justice, clean air and water, commonsense immigration reform, affordable higher education, equal pay for equal work, and so many more issues that impact working families. Don’t be fooled by the misleading “right-to-work” slogan! Modern “right-to-work” policies are being pushed by the National Right to Work Committee, The Freedom Foundation and American Legislative Exchange Council (ALEC), all funded by the Koch Brothers and big business donors. This attack on working families will allow employers to lower wages and take home bigger profits. After Wisconsin went “right-to-work,” public sector workers suffered huge pay-cuts, saw their benefits slashed, and took a step backwards to dangerous working conditions. 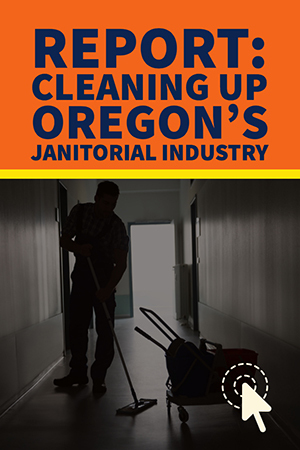 In fact, study after study has proven that these anti-worker laws disadvantage all workers, harm entire communities, and have no positive impacts on the nation’s economic growth. 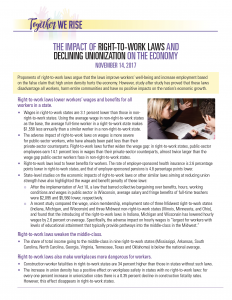 Click here to download a factsheet on the impact of so-called “right-to-work” laws on our economy.